Choose "Add a child account"
The program suggests a username for each student. You can change the suggested username if you want. Enter a password for the student. The username and passwords can easily be saved in the excel file to the right. 3. The student can now log in and start to play the game! Please note that students can only play on weekdays during school hours, from 7 am to 2 pm, after which the students' user accounts will be automatically locked. 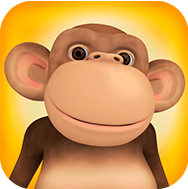 The schools or parents can buy full access from the www.10monkeys.com website, which gives unlimited access to the game. If you don't remember the password you set for a student, just reset their password as you don't need to know the last one to do this. Note that only points collected in Math World between 7 am and 2 pm on weekdays will be added to the competition.